Warm Up For Less! National Lumber Now Stocks Wood Fuel Pellets! When you’re ready to find a new heating source that is affordable and environmentally-friendly, check out wood pellets! Many people are already using wood pellets as an economical heating option. National Lumber is pleased to announce that we now have 40lb bags of Inferno Wood Pellets for sale at all eight National Lumber locations across New England. These wood pellets are also available by the pallet, with free delivery available. Stock up today! Click here to see our Locations page for store hours and directions. Selling wood pellets is another Green Initiative by National Lumber. We recycle wood scraps from our manufacturing facilities are processed by another company into wood pellets — an affordable, environmentally-friendly biomass fuel source. This is just one of many ways that National Lumber recycles. 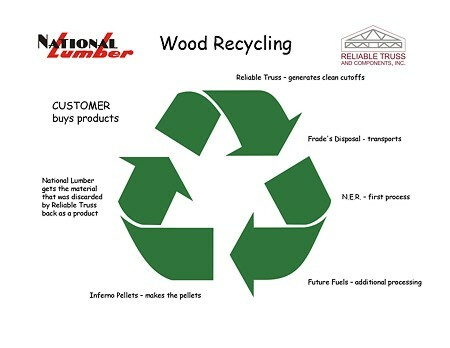 Click on the image below for a larger PDF version of the wood recycling process.